Remove special representations to reveal atoms and bonds. 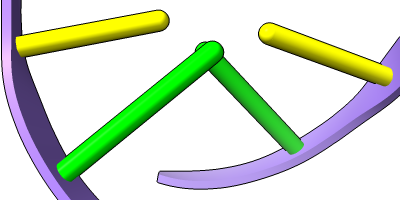 Show nucleic-acid residue pairs connected by hydrogen bond pseudobonds as rods or ladder rungs of the specified radius (default 0.45 Å). Nucleic acid residues without H-bonds to others will be shown as disconnected half-rungs if showStubs is true (default), otherwise omitted from the ladder representation. If baseOnly is true (default), connecting rungs will only be drawn for H-bonds between base atoms; if false, thinner connecting rungs (radius 0.2 Å) will also be drawn for H-bonds involving non-base atoms. Each half-rung (whether connected or not) is colored to match the C2 atom of the corresponding residue. 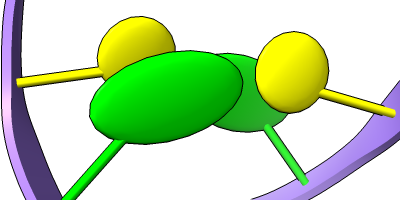 The rungs attach to cartoon at the C3' tether position, and disconnected half-rungs (stubs) end at the nucleic acid base N1 (if purine) or N3 (if pyrimidine). 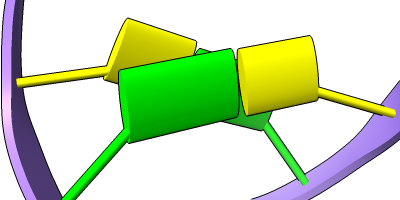 The hideAtoms option indicates whether to hide atoms/bonds for nucleotides shown as rungs (default true). 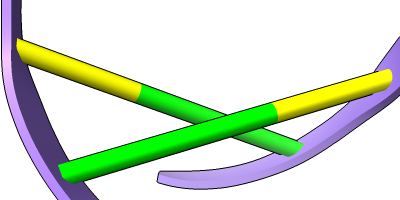 Although ladder/stub representions can be limited to specified residues, the associated parameters are per-model: e.g., different residues in the same model cannot have a different rung radius. 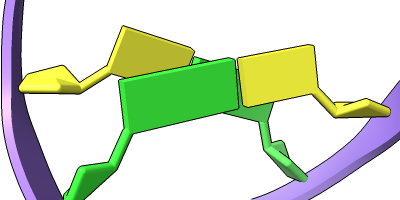 Show nucleotide sidechains as disconnected half-rungs of the specified radius (default 0.45 Å), each colored to match the C2 atom of the corresponding residue. The rungs attach to cartoon at the C3' tether position, and the stubs end at the nucleic acid base N1 (if purine) or N3 (if pyrimidine). The hideAtoms option indicates whether to hide the corresponding atoms/bonds (default true). Different residues can have different slab parameters. Show ribose atoms, but represent bases as slabs of the specified shape, dimensions, and thickness (default 0.5 Å), optionally with showOrientation bumps, as described above for tube/slab display. Each slab is colored to match the base C2 atom. 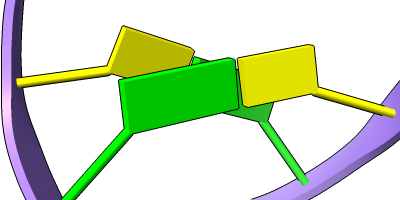 The hideAtoms option indicates whether to hide base atoms/bonds (default true).